Once an application for admission has been received and processed, students will receive a letter from the Admissions Office outlining the student's status and any documents needed to complete their admissions file. The student's WS ID is also included in the letter. Please see categories below for additional information. Submit official high school transcript, which must include graduation date and diploma type. Submit official scores from the agency that administered the high school equivalency examination. Partial high school transcripts must also be submitted, if applicable. Immunization is not required for admission, but the Immunization Health History Form must be completed and signed. Official transcripts from each school previously attended must be submitted to the Office of Enrollment Services. Student will not be able to complete any diagnostic testing until transcripts have been reviewed for placement. Transcripts will be evaluated for all degree-seeking transfer students. Evaluations must be complete before financial aid will be awarded. Students may request a copy of official transcript from admissions file for advising purposes. Transfer students who have completed hours at an institution that does not have regional accreditation will need to contact the Student Enrollment Office in order to have transcripts evaluated by appropriate academic deans. Transfer students who are unable to obtain an official transcript due to financial obligations at previous institutions will be required to complete the appropriate form in the Student Enrollment Office. If a student requests reconsideration of transfer credit decision, he may be asked to provide a copy of syllabus, course description, textbook, and anything else that will help the office to determine credibility of class. Students must submit appropriate immunization information. Submit high school transcripts or High School Equivalency scores. If applicable, submit all college transcripts. If a college degree has been earned, submit only transcripts from institution where highest degree was awarded. Submit an official transcript from home institution prior to registration. Students who have previously attended Walters State are required to submit an application. Students who have attended another institution since their last term of enrollment at Walters State are also required to submit official transcripts. The same process will be applicable for the evaluation of transcripts as for transfer students. The first step in applying for financial aid is to complete the Free Application for Federal Student Aid (FAFSA). Students should also apply for Walters State Scholarships. The scholarship deadline is February 1st for the upcoming academic year. Once a student has applied for admission and financial aid, s/he may begin checking MyWS for financial aid updates. Only eligible students enrolled in approved degree/certificate programs can receive financial aid. Please visit Financial Aid for further information and the latest financial aid news. Students may also contact the Walters State Financial Aid office at 423.585.6811 or 1.800.225.4770, ext. 2. Degree-seeking students under the age of 21 with a regular high school diploma must provide valid ACT or SAT scores taken within the last three years. While Walters State will accept either national ACT scores or Walters State Residual ACT scores for admissions purposes, only national scores will be considered for the Tennessee Education Lottery Scholarship. For more information, please contact Counseling and Testing at 423.585.6800 or toll free at 1.800.225.4770, ext. 3. Degree-seeking students over the age of 21 who have not taken a transferable college-level English and math will be required to take the Accuplacer exam for placement purposes in English, math, and reading. High School Equivalency recipients who do not have a prior college-level math or English may also take the Accuplacer exam regardless of age. Non-degree seeking students will not be permitted to enroll in math or English courses without transcripts documenting a college level math and English class or appropriate testing. Step 4 is not required for readmit and transfer students. Students must complete online orientation prior to attending an on-campus orientation in Morristown, Sevierville, or Greeneville. When a student attends an orientation on campus, s/he will have the opportunity to meet with an academic advisor and register. Step 5 is not required for a first-time student's first semester, if s/he met with an advisor at orientation. Once a student has obtained admission and submitted appropriate test scores or college transcripts, s/he may schedule an appointment to meet with an academic advisor. Advisors are determined by the student's major. Degree-seeking students must meet with an academic advisor every semester prior to registration. Non-degree seeking students are not required to meet with an academic advisor before registering; however, students should remember to bring college transcripts or submit appropriate test scores if a math or English course is desired. Students are encouraged to complete their admissions file and register as soon as possible. Registering early allows for more flexibility when building a schedule as more course offering and times are available. The enrollment process is not complete until all fees are paid. Your class schedule will be deleted if your fees are not paid by the deadline. Fees may be paid online through MyWS or at any Walters State campus. 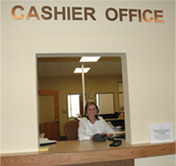 For additional information regarding fee payment, please visit the Cashier's Office.